Peabody & Champbell with John Campbell 1836-1837. Peabody & Guiteau with Calvin Guiteau 1839-1843. Gowdey & Peabody with Thomas Gowdey 1843-1847. Owned the Peabody Craft Shop and worked as a silversmith for George Gebelein in Boston. Member of the Boston Society of Arts & Crafts. Maker of sterling Arts & Crafts handwrought flatware. Partnership between Edward Pear and Thomas Bacall. Founded by Thomas and William B. Pear. Founded by Frank T. Pearce. Successor to Pearce & Hoagland. Manufacturer of pens and related items. Walter Pearce / Walter Pearce & Co. Worked as a bookkeeper for another jeweler in Mobile 1855-1859 and was presumably not working on his own during this time. Was in the partnership of Walter Pearce & Co. 1859-1867. Brothers Moses and Thomas Peason. Was in the partnership of J.G. Pearson & Co. c. 1849-1851. In partnership with Thomas Pearson c. 1856 as M. & T. Pearson. One of the founders of Shop One in Rochester (in business 1952-1976). Founded Ronald Hayes Pearson Design Studio in Maine in 1971; Pearson died in 1997, and the Studio continues today. Maker of handwrought modernist jewelry, accessories, sculpture and ecclesiastic items. Maltby Pelletreau, John Bennett and D.C. Cook. Maltby Pelletreau & Stephen Upson. In the partnerships of Clark & Pelletreau c. 1819; Pelletreau & Upson c. 1824; and Pelletreau, Bennett & Cook with John Bennett and D.C. Cook 1826-1828. Was in partnerships of Pelletreau & Van Wyck with Stephen Van Wyck in New York, NY c. 1815 and later Pelletreau & Richards with Thomas Richards c. 1825. A partnership between Josiah Penfield and Frederick Marquand. Apprentice to his uncle Isaac Marquand c. 1800. Became a partner of the firm of Marquand & Paulding in 1810, renaming it to Marquand, Paulding & Penfield with Isaac Marquand and Cornelius Paulding until its dissolution in 1815. Was in the partnership of Penfield & Co. 1820-1828. Henry J. Pepper and son Samuel W. Pepper. In the partnerships of Stockman & Pepper 1828-1831 and H.J. Pepper & Son 1846-1853. In the partnership of H.J. Pepper & Son 1846-1853. Founded by David C. Percival. Successor to Percival & Morris (see D.C. Percival Jr. & Co. below). Primarily manufacturing jewelers. 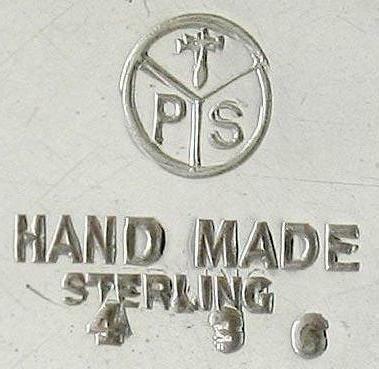 Sterling thimbles bearing their P mark were made for them by the Waite-Thresher Co.
David C. Percival with partners Daniel Morris and Henry T. Salisbury. Succeeded by Percival & Morris when Salisbury retired in 1872. In the partnership of Peters & Stockman with Jacob Stockman 1817-1819. Went by the firm name of J. Peters & Co. 1837-1850. After working for Georg Jensen and Henry Birks & Sons, Petersen set up his own shop in 1944, registering the name C.P. Petersen & Sons in 1946. 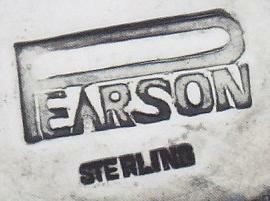 Peterson retired in 1975, and the company continued until 1979.
on the lower right was used after about 1915.